On Wednesday 28th October, Le Cordon Bleu London celebrated its 120th anniversary in a special evening for 200 guests, which included some of the most respected personalities in the industry and many of the school’s alumni. For one night only, the London school which sits on Bloomsbury Square was given a complete makeover that saw four floors become an exhibition of the evolution of gastronomy and the history of Le Cordon Bleu. Guests were taken on one of the greatest culinary journeys via a timeline which flowed around the school and dated back to 1895. The exhibition began by giving an introduction to cuisine, which was then followed by a reconstruction of one of the very first demonstrations that came as a result of the success of La Cuisinière Cordon Bleu Magazine. Each stop along the timeline marked a significant moment on the journey which turned the Parisian cookery school into the leading culinary and hospitality educator across the globe. Each room also showcased a range of canapés that held relevance to the historical moment. The second floor came next and illustrated the history of Le Cordon Bleu worldwide and Le Cordon Bleu London, before reaching the third floor which outlined Le Cordon Bleu’s vision for the future and the progress of its academic programmes. The celebration concluded on the fourth floor by a speech made by Mr André Cointreau, President of Le Cordon Bleu and warm messages from many of our well known alumni. 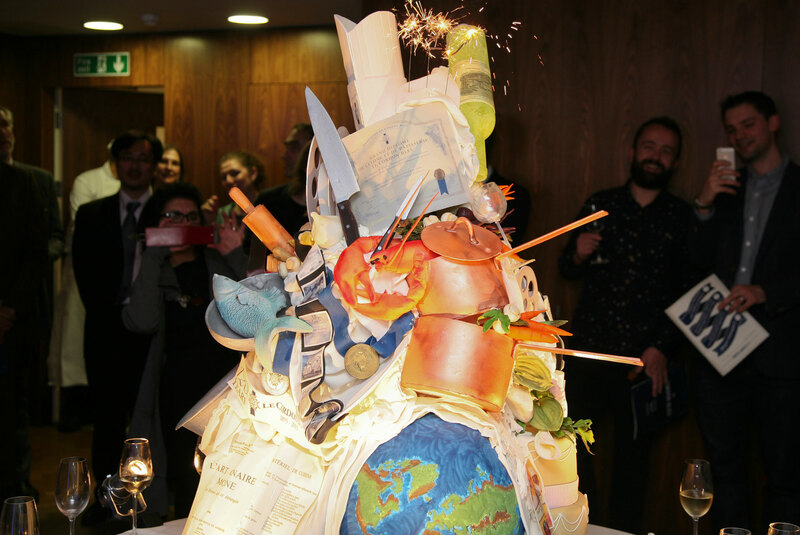 A champagne reception followed after the cutting of the impressive 120 years birthday cake created by our very own Chef Julie Walsh and the pastry team. In a bid to recreate past times, Le Cordon Bleu London also designed and wrote a limited edition La Cuisinière Cordon Bleu Magazine which closed in 1962, but its inception and consequent success undeniably helped establish Le Cordon Bleu as it is today, the world’s leading culinary and hospitality educator.